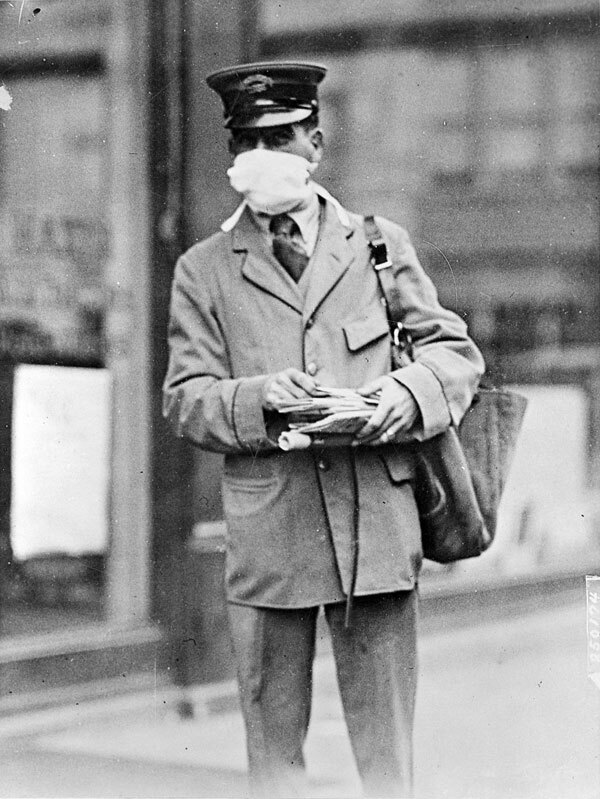 Letter carriers, mass transit workers, and others who came in contact with the public, were especially vulnerable to disease. Wearing a face mask helped them avoid contagion. Record held at: National Archives at College Park, MD. Record number 165-WW-269B-15. Telegram from squadron official, Wilbur Wright Field, Fairfield, Ohio, to Adjutant General, Washington, D.C., regarding death of a private, October 16, 1918. Army Air Forces. The flu spread rapidly in institutional settings, including military barracks where men shared close quarters. 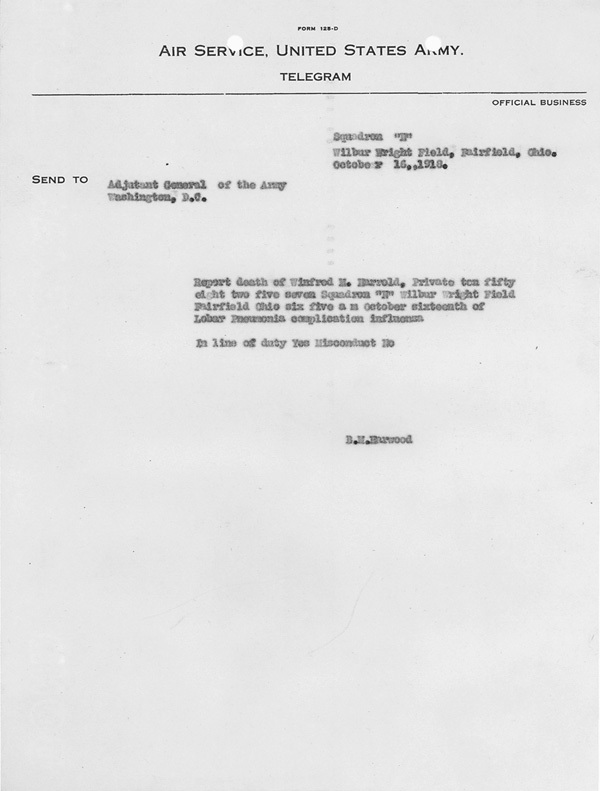 This notification of the death of an army private is one of thousands sent from military bases to families and other government officials. Record held at: National Archives at Chicago. Record Group 18. New Mexico, December 20, 1918. Bureau of Indian Affairs. Dr. D. A. Richardson, a physician visiting a New Mexico pueblo, describes the symptoms and course of treatment for flu victims. The disease progressed erratically. Some patients recovered, having followed the doctor's orders to remain prostrate and have liquids only. Others deteriorated rapidly, contracting pneumonia and dying within days. Record held at: National Archives at Denver. Record Group 75. Officials feared mass hysteria in major cities. Citizens were urged to stay indoors and avoid congested areas. Here, policemen patrol the streets to ensure public safety. Record held at: National Archives at College Park, MD. Record number 165-WW-269B-25. 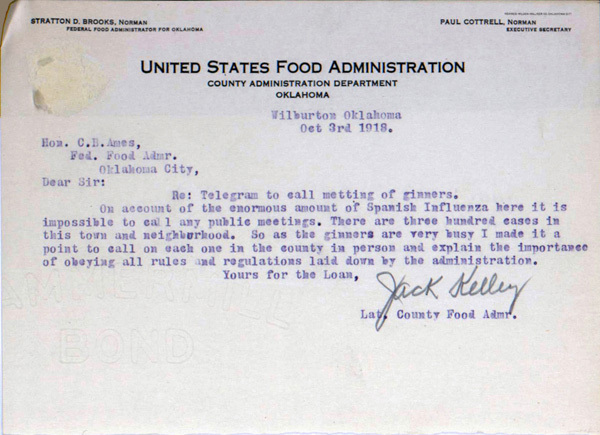 Telegram from county food administrator to headquarters, Oklahoma City, regarding cancellation of public meetings, October 3, 1918. U.S. Food Administration. 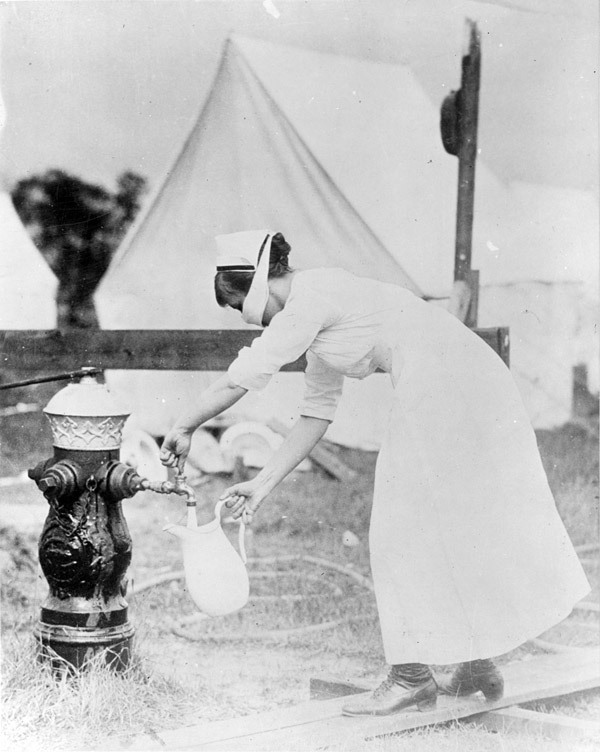 The flu interrupted the activities of the U.S. Food Administration responsible for rationing during World War I. The Administration's Wilburton, Oklahoma, office cancelled its public meeting because of 300 reported cases of flu in the area. Record held at: National Archives at Fort Worth. Record Group 4. Record held at: National Archives at Kansas City. Record Group 75. In October of 1918, Congress approved a $1 million budget for the U. S. Public Health Service to recruit 1000 medical doctors and over 700 registered nurses. Nurses were scarce, as their proximity to and interaction with the disease increased the risk of death. Record held at: National Archives at College Park, MD. Record number 165-WW-269B-5. 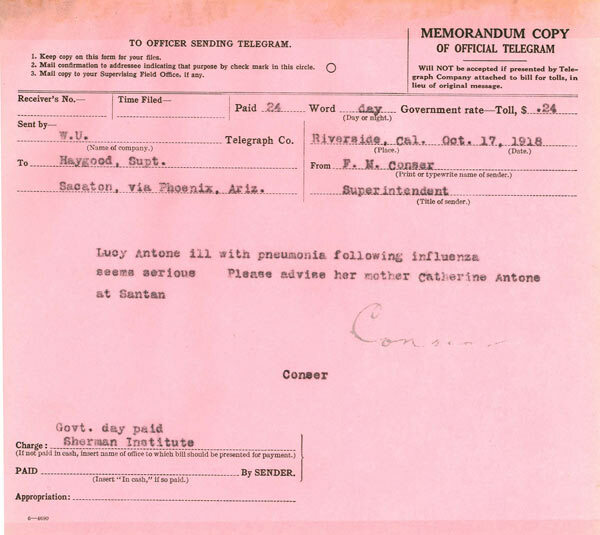 Telegram to Superintendent of the Pima Agency, Arizona, regarding condition of flu patient, October 17, 1918. Bureau of Indian Affairs. The flu spread rapidly in institutional settings, including government operated Indian schools. This notification of a student's pneumonia following influenza is one of thousands sent from Indian schools to next-of-kin. Record held at: National Archives at Riverside. Record Group 75. 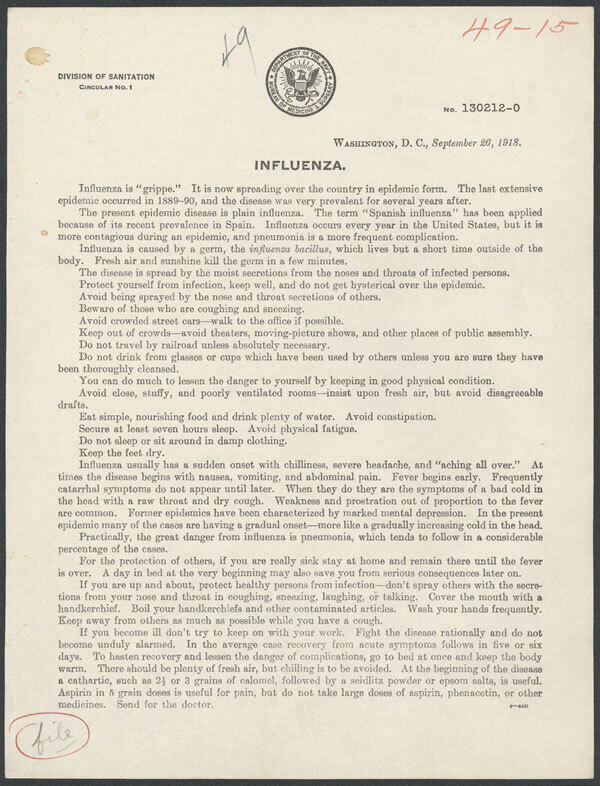 The Navy Department tried to prevent the spread of the influenza by educating sailors about protecting themselves. In Circular No. 1, the Navy's Bureau of Sanitation suggests fresh air, adequate sleep, and fluids to stay healthy. Record held at: National Archives at New York City. Record Group 181. 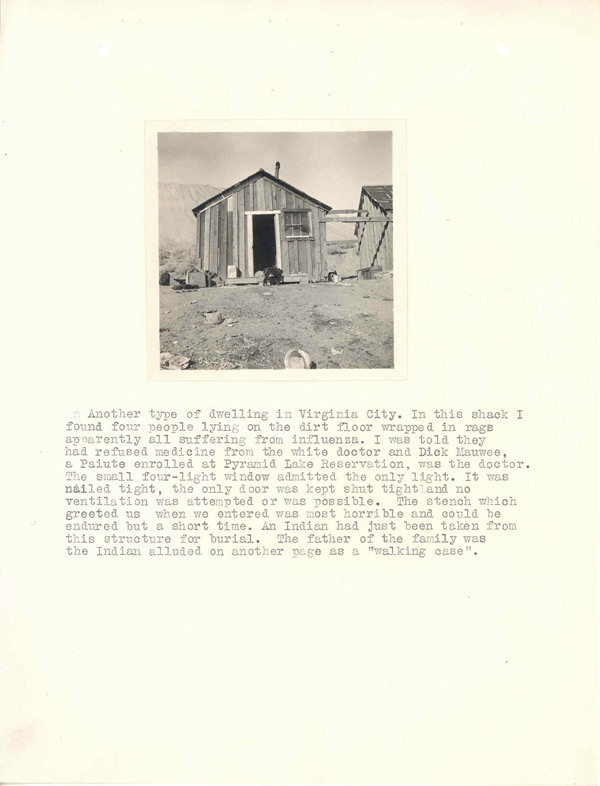 Photo of Indian dwelling and description of conditions at Reno Indian Agency, Nevada. Because of the Federal government's role in administering Indian reservations, the effect of the flu on Indian populations is well documented. 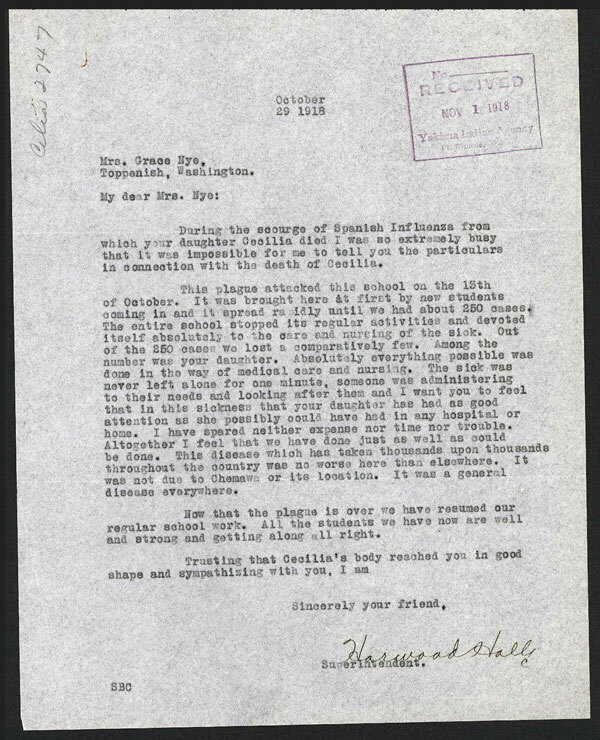 At the Reno (Nevada) Agency, an agent took photographs and compiled detailed notes: "In this shack I found four people laying on the dirt floor wrapped in rags apparently all suffering from influenza." Record held at: National Archives at San Francisco. Record Group 75. 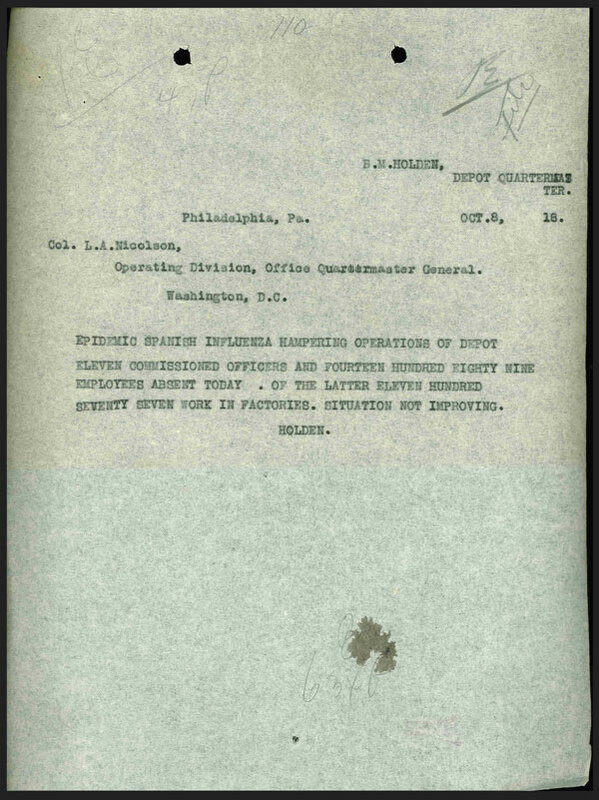 Report on staffing crisis at military depot in Philadelphia, October 8, 1918. Office of the Quartermaster General. 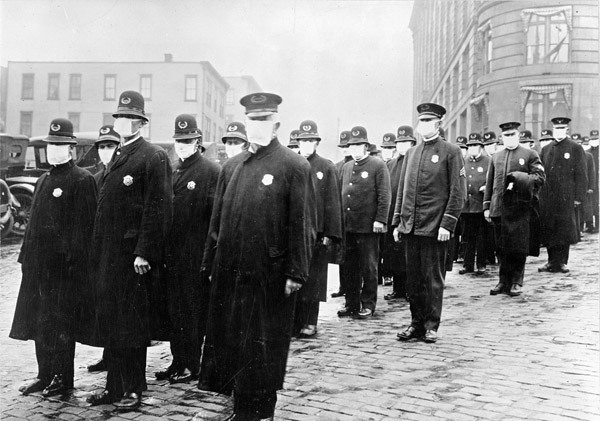 The flu was highly contagious and spread rapidly, as documented in a military report notifying the Office Quartermaster General in Washington D.C., of a staffing crisis. The report notes 11 officers and 1,489 employees "absent today," with the situation not improving. Record held at: National Archives at Philadelphia. Record Group 92. Notice to occupants of Western Shoshone Agency, Nevada, of rules for duration of the flu. Because of the Federal government's role in administering Indian reservations, the effect of the flu on Indian populations is well documented. 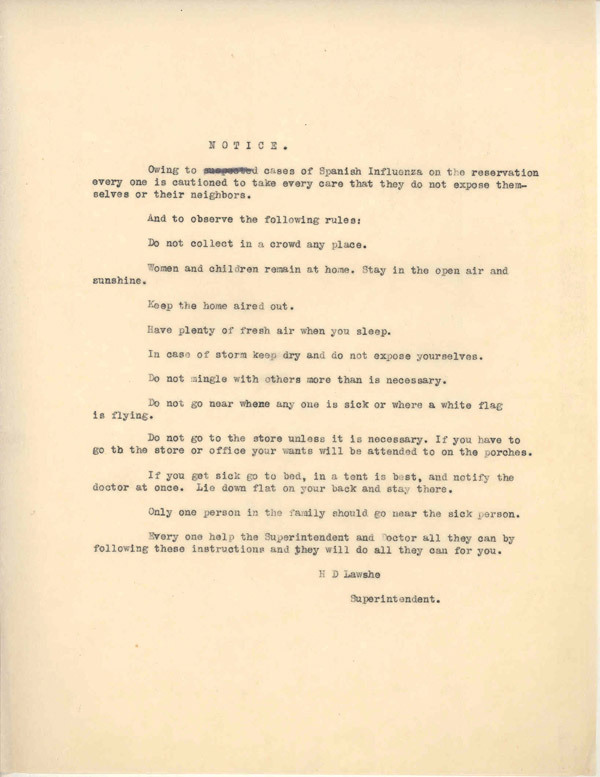 Residents of Western Shoshone (Nevada) Agency received a notice of rules, such as keeping the home aired out, and women and children were to stay home, which they were to follow for the duration of the epidemic. 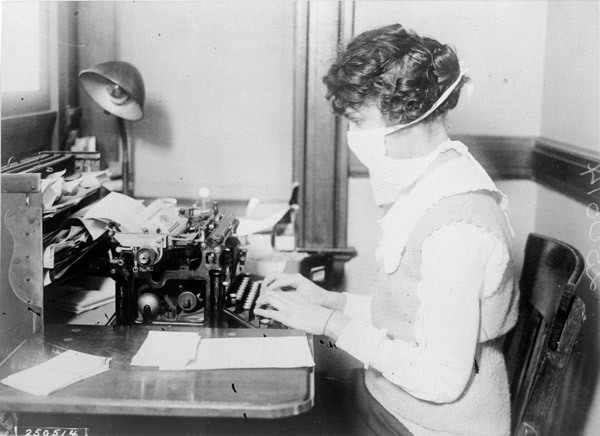 Typist wearing mask, New York City, October 16, 1918. The flu prevented day-to-day operations from going smoothly. Officials advised all persons to wear face masks, even indoors. Many believed that a person could contract the disease by handling documents and equipment. Record held at: National Archives at College Park, MD. Record number 165-WW-269B-16. October 29, 1918. Bureau of Indian Affairs. Because of the Federal government's role in administering Indian reservations, the effect of the flu on Indian populations is well documented. This notification sent to the parents of a student at an Indian boarding school is typical of many letters on file. Record held at: National Archives at Seattle. Record Group 75. Hospital staff hand wrote admissions daily to South Beach Hospital. The journal notes that six people were admitted on Christmas Day and that John N. Friel was admitted on December 27, 1918 at 5 pm and died on January 2, 1919 at 1:25 a.m.
Record held at: National Archives at Seattle. Record Group 18. Street car conductor in Seattle not allowing passengers aboard without a mask. 1918. Mass transit systems, with crowds of people in close quarters, were fertile venues for the spread of disease. 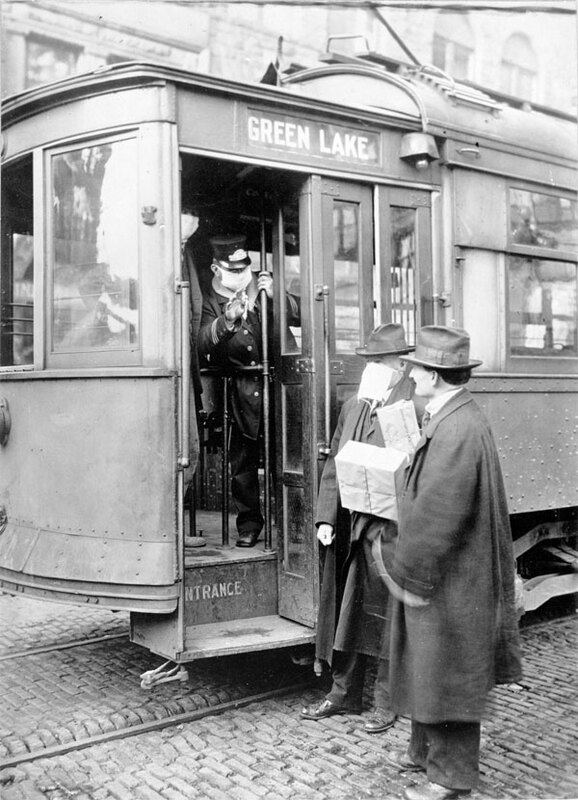 In Seattle, public health officials required passengers and employees wear masks as a precautionary measure. Record held at: National Archives at College Park, MD. Record number 165-WW-269B-11.